The MPHA Spring Awards Breakfast, Our Health, Our Future, is the Commonwealth’s signature public health event of the year. The breakfast provides an opportunity for the public health community to come together to salute our partners in public health, celebrate our accomplishments, reconnect with colleagues, and energize ourselves for public health advocacy going forward. 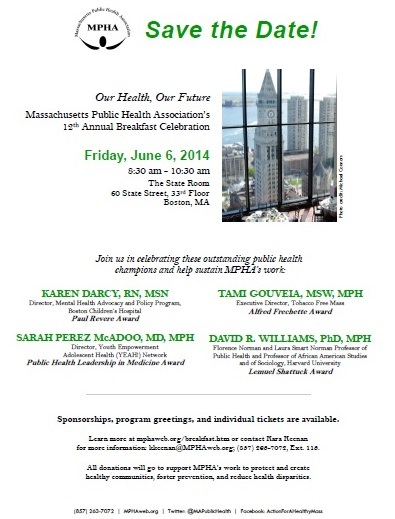 Join us in the celebration on Friday, June 6th as we honor four outstanding leaders in the Massachusetts public health community: Karen Darcey, Tami Gouveia, Dr. Sarah Perez McAdoo, and Dr. David Williams. By helping us to honor these public health visionaries, you will help sustain and expand MPHA’s efforts. All proceeds from the event will go to support MPHA’s work to protect and create resources for prevention and advocacy in addition to supporting MPHA’s Act FRESH campaign. Act FRESH is building healthier communities for all residents by improving access for healthy, affordable food and safe public spaces for physical activity. We aim to protect and create healthy communities, foster prevention, and reduce health disparities. Sponsorships, program greetings, and individual tickets are available. For more information please visit our website: http://www.mphaweb.org/breakfast.htm or contact Kara Keenan at kkneenan@mphaweb.org; (857) 263-7072 ext. 113. Thank you to the sponsors and honorees from the 2013 11th Annual Spring Breakfast. Be sure to view the photos from last year’s amazing event and MPHA’s other past honorees. Unable to attend? Make a donation to MPHA and demonstrate your continued support for public health in the Commonwealth!